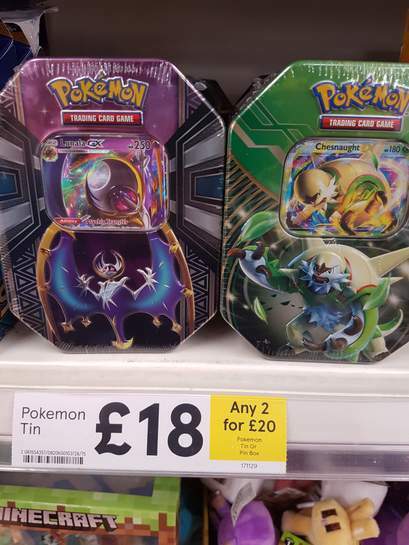 Tescos have 2 for £20 on the Pokemon Trading Card Tins. Normally £18 each. 4 boosters in each tin so good value even if you don't want the ex cards. They have various other "2 for x" deals too. What store/branch was this in? Oh back at the old normal price.. heat.. Think they are £13.99 argos at the moment. I remember getting one of these for 75p! (A Samurott one) Label on shelf was wrong but i think the employee thought "Eh, a small tin with 1 card? worth 60p at max", at least that's what it seemed like to me.